■ Features(1) : Four fabricating processes are combined into one machine. ■ Features(2) : The swinging press mechanism allows for high-accuracy bending. Bending without backgauging can be also performed. 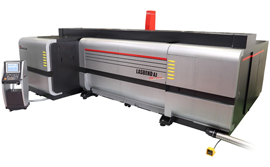 ■ Features(3) : The fiber laser provides lost-cost, high-speed cutting. Highly reflective materials (such as copper and brass) can also be cut with the fiber laser. ■ Features(4) : High productivity is achieved through continuous operation.